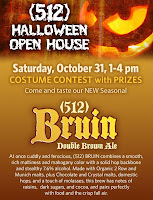 (512) Brewing in Austin is having an open house and costume contest at the brewery on Halloween from 1pm ~ 4pm. Their new seasonal, a Double Brown Ale named (512) Bruin, will also be available for sampling. I look forward to giving it a try the next time I make it up to Austin.